Not going to lie, it’s been mild in Georgia. So on the day after Christmas, my family and I (+ one of my close friends, who is practically family which is why this statement is in parentheses) drove down to Arabia Mountain on a cloudy, almost-rainy day for a hike. Arabia mountain is a massive exposed granite field, kind of like Stone Mountain but without the controversy. The weather was honestly quite nice for the hike (hovering at around the 50s), if it had been hot, we would have had a miserable time as the mountain had little to no shade. But, my sister did manage to find a tree… and then of course proceeded to climb it. It was mostly just a fun, relaxed trip. The trail wasn’t difficult: though it was uphill, it wasn’t steep, and it was only a total of about 1.2 miles. Because my friend and I were both camera nuts, we ended up spending the majority of the time taking pictures instead of hiking, which of course, made our trip much longer. Still, it was a trip that was easily fit into an afternoon. If you’re considering going to Arabia Mountain, I highly recommend it! 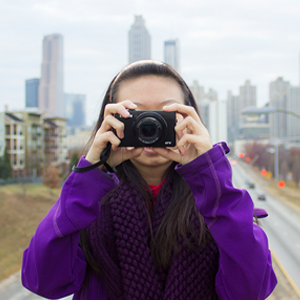 Be sure to bring a camera and some friends along with you–the best part of going places is always the conversation. Hope you’ve enjoyed this low key blog post–more of a photo journal than anything else. What are some of the chill places you’ve been to?